If you have ever driven on Hwy ‘400’, used the West Parry Sound Health Centre, visited the Bobby Orr Hall of Fame, attended the Festival of the Sound at the Stockey Centre, docked at the municipal marina or simply played hockey, baseball, soccer or participated in figure skating or any other number of activities at local arenas or community centres, chances are, you have benefited from Ernie’s dedication to Parry Sound. You can take Ernie out of Parry Sound but you can’t take the Parry Sound out of Ernie. As Ernie describes it, Parry Sound had a “profound effect on his life”. Ernest Larry Eves was born in Windsor Ontario in 1946 to Julie and Harry Louis Eves. When Ernie was 17, his father’s employment brought the family to Parry Sound where Ernie finished his final year of high school. While reluctant at first, Ernie was quickly impressed by the town’s collegiality. Ernie went to the University of Toronto then on to Osgoode Hall Law School. Summer employment for Ernie introduced him to William Green, a Parry Sound lawyer renowned for his community service. Ernie describes Bill as “a person of the upmost integrity” who served as Chair of the Board of Education and Hospital Board. Ironically, Bill was also President of the Local Liberal Association. Bill’s social values influenced Ernie and heightened his own dedication to community service. This ranged from being a founder of the local Big Brothers Association to serving as Deputy Director of Legal Aid. Ernie was instrumental in helping the local native community and Children’s Aid Society. He was also President of the Parry Sound Golf Club, Curling Club and Kinsmen Club where he received the National Presidents Award for his work with cystic fibrosis children. 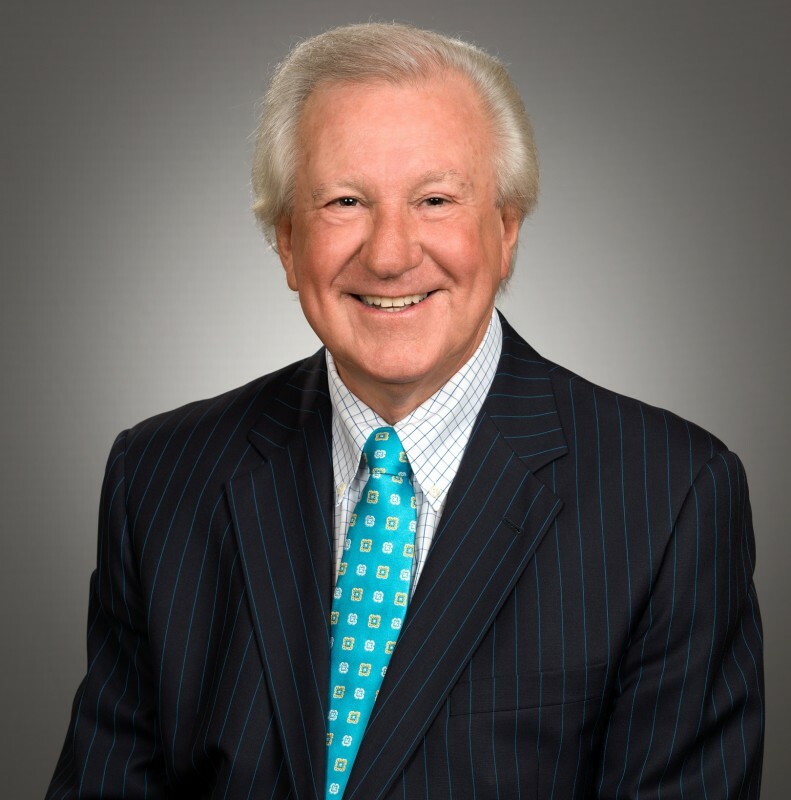 Once called to the bar, Ernie joined Bill Green’s law practice as a partner. Ernie is quick to share his affections for Bill and Elizabeth and credits Bill for his path into politics. Although Liberal, Bill suggested that Ernie assist the local Conservative Party candidate, Gordon Aiken. Ernie then became the president of the Conservative Party Association, launching a political career that lasted three decades. In 1981, his predecessor, Lorne Maeck announced his retirement. With support from his wife Vicki and two children, Natalie and Justin, Ernie decided to take a run at politics. Ernie won the election by a slim 6 votes which earned him the “Stan Darling” nickname, “Landslide Eves.” This would prove to be just the first of 8 election victories for Ernie; a political journey that would see Ernie hold numerous portfolios and positions in government. Ernie entered political life for all the right reasons; wanting to make a difference in the lives of others. As Bette Stephenson’s Parliamentary Assistant, Ernie gained valuable insight into helping young people with special needs; a cause near and dear to his heart, understanding the challenges his own son Justin faced every day. Ernie has always felt very privileged to have had the opportunities to serve the public in various capacities culminating in Deputy Premier, Minister of Finance and ultimately, Premier of Ontario. Northern Ontario status for Parry Sound had been an issue for decades before Ernie arrived in Queen’s Park. Under his leadership and determined advocacy, Parry Sound District’s Northern Status became a reality. As Minister responsible for Native Affairs, he championed major changes in First Nations self-government, convincing then Premier Frank Miller, to join him in that fight. As Minister of Community & Social Services, Ernie led the reform of Social Services and Children’s Aid Societies as well as opening the first homes for abused women and children in Ontario ensuring that Parry Sound and Mattawa both in his constituency, were two of the twelve. It took a great deal of work to bring two hospital boards together. At a time when the operating rooms were inadequate, the emergency waiting room was in a hallway, and emergency air transport landing was not available, the prospect of expensive renovations to ‘band aid’ the problems were set aside by Ernie. He challenged the status quo and suggested that Norm McIvor, then CEO of the Parry Sound General Hospital, make application for a new facility to serve the West Parry Sound health care needs. There were more than a few people at the General and St. Joseph hospitals who were skeptical of his suggestion and who were in turn, afraid to take that chance. Ernie persevered and put together a group of supporters from each hospital and the community. Ernie fought hard ‘scratching and clawing’ through the bureaucracy to convince his counterparts that this was the right thing to do. His efforts moved the project from the initial helipad idea to the new West Parry Sound Health Centre on Albert Street. As one approaches the facility, the road titled ‘Ernie Eves Way’ can take on many different contexts! Parry Sound has always been proud of our hometown boy, Bobby Orr. For many years, local individuals identified the importance of creating a place where his heritage could be shared. Similarly, another group representing the long cherished Festival of the Sound were looking for alternatives to holding concerts in a high school gym. Premier Bill Davis visited Parry Sound shortly after Ernie was elected. They spent a great deal of time on the waterfront with Premier Davis recognizing the opportunity for some form of development. As a matter of principle, Ernie was firm that, whatever was built there had to be a public place, not a private one. With both the Bobby Orr Hall of Fame and the Festival of the Sound, needing a home, Ernie knew it was common sense to put the two together and develop a site. After many long battles and Ernie’s continued efforts to open doors to funding; together with Bobby Orr and Charles Stockey, they made the dream a reality. It is now where we all sit today to celebrate the 12th Annual Bobby Orr Hall of Fame Induction. Ernie left the legislature 10 years ago while representing the riding of Dufferin Peel Wellington Grey. Ernie is still active in political commentary and sits on several public and private Boards of Directors. He is active in several charities including the board of Special Olympics Canada. Ernie Eves is very proud of his daughter Natalie, a successful local veterinarian. Sadly his son Justin lost his life in a car accident in 1995 but his memory lives on through the Justin Eves Foundation. The Foundation is operated by Ernie, Vicki and Natalie and helps raise post-secondary funds for children with learning disabilities. The Foundation will always hold a very special place in Ernie’s heart. Ernie lives in Caledon with his partner Isabel Bassett. They enjoy the outdoors both in Caledon and in the Parry Sound-Muskoka area. Ernie can often be seen in Parry Sound spending time with his daughter Natalie, son in law Mike and grandchildren Michael and Henley.